But if we were a cafe serving up coffee, you’d also see opening hours, address, what times the cafe is usually busy, and any other information that Google thinks you’d be looking for. Users don’t simply look things up on the internet, they Google it. Over 3.5 billion searches are made every single day on Google, so you want to make sure you can be found. In 2015, Google introduced the concept of ‘micro-moments’, speaking to the idea that people expect an immediate answer in the moment—they want to know, go, do and buy. Google says this kind of search behavior is on the rise, with consumers forgetting what it was like not getting answers to their questions immediately. Google guides you through the process effortlessly. It’ll only take up a few minutes of your time to set up, but will boost your business’ visibility exponentially when searched for. Gone are the days where repeating a keyword on your website made Google take notice of your brand and hand you the number one spot on the search engine results page. By listing your business and providing as many details as possible, you give Google enough information to decide if you’re offering what a user is searching for, while potentially beating your competitors to the top spot. Google encourages users to review businesses, leave comments, and ask questions—all places where you can engage with your audience and build a relationship with them. Eighty-five percent of consumers trust online reviews as much as personal recommendations, so it pays to keep an eye on what people are saying about you and respond to any problems. Plus it’s always a morale booster to see all the positive things your customers are saying about you! There’s lots of tools you can use in Google My Business to make the journey seamless for your customers, from adding a booking form to enabling users to order online from your business. Google can even help you build a basic website for free if you don’t have one. It’s autogenerated from the information that you’ve already given Google, so they’ve done a lot of the hard work for you. These insights also help you learn about your customers’ actions—where did they click? What images are getting the most views? How many customers tried to call you? All of this information can be used to better target your old customers and bring in new ones. …if you haven’t already. As we mentioned earlier, Google tries to give as much information to a user as it knows, so it may have already formed a listing for you. It’s simple to create yours from scratch, however. Just use an email that’s associated with your brand or business. Give Google as much information as possible about your business. Fill out all the sections you can, making sure all information is in line with any of your other online points of customer contact. Google will already have some information on your brand or business, and is probably trying to fill in the blanks itself. They also encourage their users to help them do this, by allowing them to suggest edits to your business’ listing if they know the answers. So, it’s likely that they have some of the information wrong. In the best case scenario, this misinformation is slightly embarrassing for your business. In the worst case scenario, you lose a customer. 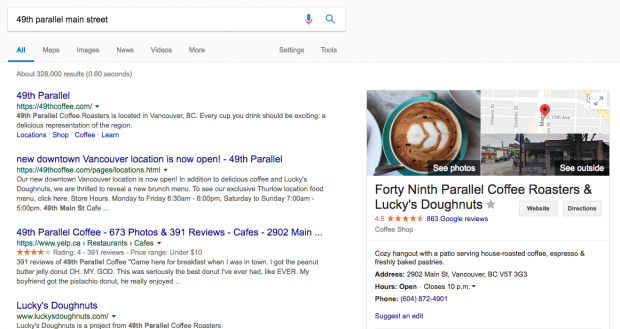 So by at least updating your Google My Business listing, you’re able to control the information out there and ensure your customers are always (correctly) in the know. In fact, you could take half an hour and read our blog post on improving your social media profiles to ensure consistency throughout all of your online profiles. That way a customer always has the most up-to-date information on every platform they’re viewing you on. And show off your business! Humans are visual by nature and want to see what you’re all about, not just read about it. So use photos to give the searchers what they want. These can be images that you’ve taken yourself, or ones that you’ve asked a professional to do. Think about the first impression they’ll give of your business, and see if it’s worth investing in paying for higher-quality images. You want customers to be attracted to your business, so show it off in the best way possible. Check in as often as you can, making sure information is up to date and that there are no unanswered questions or reviews you need to respond to. The more you put into Google My Business, the more you’ll get out of it. Got a sale on or a special offer? Or even a company update? Take advantage of Google My Business posts and let customers know about it. Google My Business Posts are news updates that you can create about your business that are published directly on your listing. They also provide analytics, so you can see how well a post has performed and which one was most popular with customers. Creating a post takes no time at all and can help you reach a wider audience. Now that you have enough information to get started using Google My Business, get out there, get listed, and get new customers.